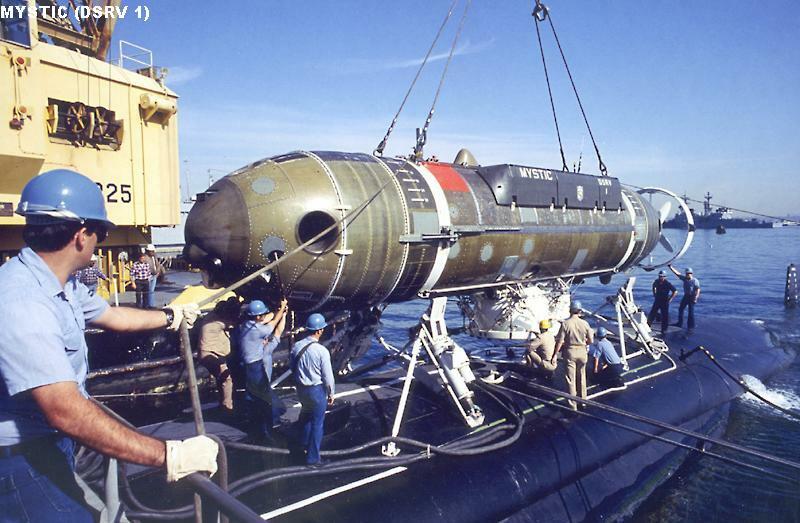 This list includes all US submarines and manned submersibles of all types. Note: Most submarine propulsion data is not publicly released. The data given in this list is based on typical unofficially reported information. Concept/Program: Large, extremely capable and extremely quiet SSBNs. They have replaced all previous SSBNs, and form the bulk of US strategic forces. The first four boats of this class are scheduled for conversion to guided missile/special operations submarines. Ohio has recently completed her final patrol as a ballistic missile submarine and is now awaiting SSGN conversion; see below. Builders: General Dynamics/Electric Boat, Groton, CT.
Design: A completely new SSBN design, considerably larger than previous designs, and carrying more missiles than any other SSBN. They are reported to be extremely quiet. Modernization: SSBN 732 has been refitted with Trident II (D-5) missiles; SSBN 733 is being refitted, and SSBN 730 and 731 will follow. 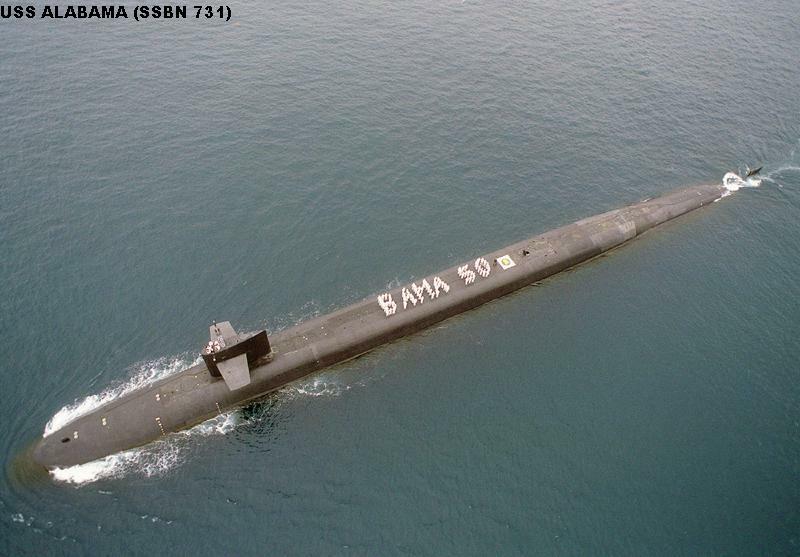 Disposal Note: All previous SSBNs have been discarded, except Daniel Webster (ex-SSBN 626) and Sam Rayburn (ex-SSBN 635) survive as immobilized dockside training platforms, with their missile compartments removed. Concept/Program: The first four SSBNs will be removed from strategic service starting in 2003 and will undergo a major conversion to combined guided missile/special operations submarines. Ohio has recently completed her final patrol as a ballistic missile submarine and is now awaiting SSGN conversion. The Trident missile tubes will be replaced by launchers for Tomahawk cruise missiles, and Dry Deck Shelters for SEAL equipment will be installed on deck. Builders: General Dynamics/Electric Boat, Groton, CT. Conversions by Puget Sound NSY (first two), Norfolk NSY (second two). 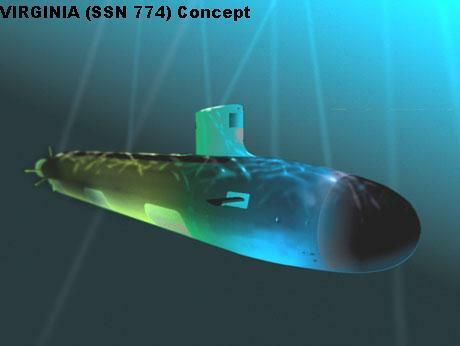 Concept/Program: A new-design SSN, intended to be more flexible and less expensive than Seawolf; it is planned to build up to 30 of these boats, to supplement and eventually replace the Los Angeles class. Builders: General Dynamics/Electric Boat, Groton, CT and Northrop Grumman Newport News, VA (teamed). Design: Intended to be a very quiet boat, and more technologically advanced than previous classes, but less expensive and more adaptable to future technologies and equipment. Designed to accommodate a SEAL team and their equipment; will be fitted to carry Dry Deck Shelters. There are several proposals for additional equipment and upgrades to be phased-in over the course of construction, including electric drive, additional VLS tubes, external weapons tubes, greater use of UUVs/ROVs, and an extra hull section to accommodate these systems. Concept/Program: A completely new and highly capable design, without a doubt the world's finest SSNs. Considered too expensive to procure in large numbers, so production was terminated in favor of the SSN 774 class. There were numerous technical problems during construction, but these appear to have been resolved. SSN 23 is being converted to a "special missions" boat and is listed separately. Design: A new, large design with emphasis on extremely quiet operation, integrated combat systems, and automation. Have a highly automated torpedo handling system, anechoic hull tiles, and larger-diameter torpedo tubes. Concept/Program: USN's "standard" SSN. These boats are highly capable multirole vessels, and will form the bulk of the US SSN force for many years. 11 of the earlier boats have been decommissioned to save refuelling costs, but there is growing interest in halting the premature decommissionings and refuelling the boats instead. 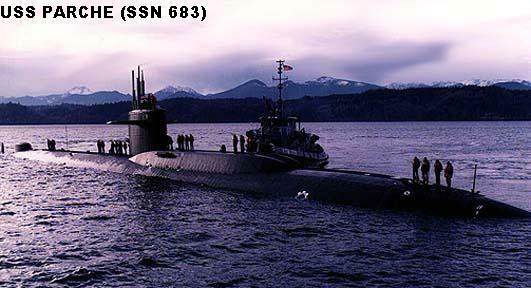 SSN 691 has been modified for trials purposes and is listed separately. Builders: General Dynamics/Electric Boat, Groton, CT; Newport News SB&DD, VA.
Design: A new design intended to recover speed lost in previous classes. 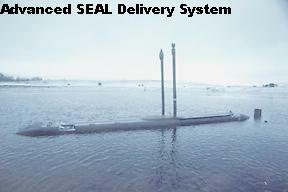 Later boats have progressive improvements, including VLS tubes for Tomahawk (SSN 719+), integrated combat systems (SSN 751+), under-ice capabilities (SSN 751+), and minelaying capability (SSN 751+). 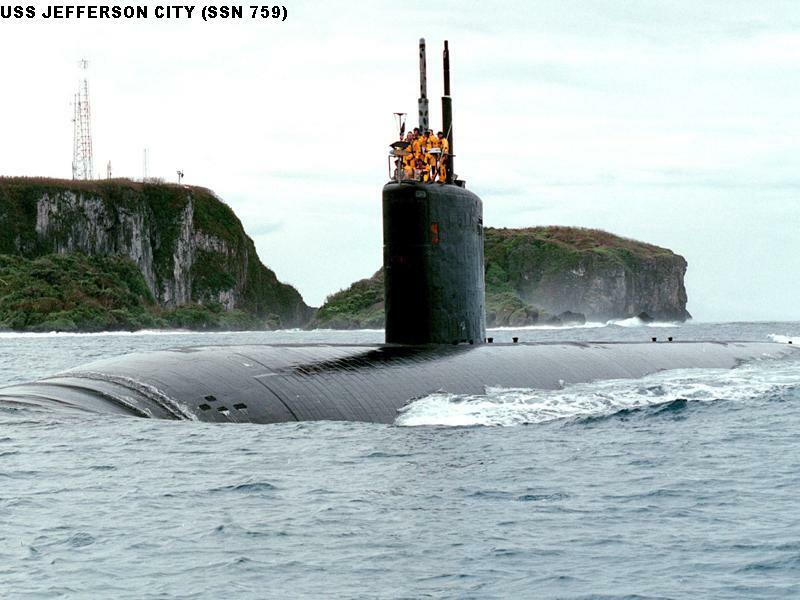 Several boats are fitted to carry Dry Deck Shelters for SEAL operations, including SSN 688, 690, 700, 701, 715. Modernization: A variety of upgrades are being considered, including improved communications, UAV and ROV/minehunting capabilities, new sonar processing systems, and WAA sonars. Disposal Note: All previous SSNs have been discarded, except Parche (SSN 683), listed below. 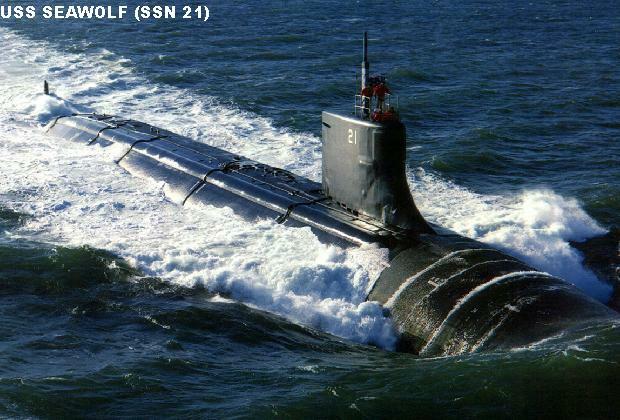 Concept/Program: The 3rd Seawolf is being completed as a special operations (SEAL transport) and special missions (undersea recovery) submarine. The conversion includes an additional hull section, providing space for various minisubs, ROVs, UUVs, and other underwater vehicles and equipment. Although nominally considered a "combat-capable" submarine, will be primarily employed in these roles, not as a conventional SSN. Concept/Program: A Sturgeon class boat extensively modified to carry out "ocean engineering", deep-sea search and recovery, and other special missions. Will be replaced by Jimmy Carter (SSN 23). Builders: Litton/Ingalls SB, Pascagoula, MS; conversion by Mare Island Naval Shipyard, Vallejo, CA. Conversion: Modified in 1976 for ocean engineering role; refuelled and extensively converted 1987-1991 to improve capabilities; modifications include a 100 foot hull extension forward of the sail. Concept/Program: A Los Angeles class submarine modified as a seagoing testbed for new submarine technologies and weapons. 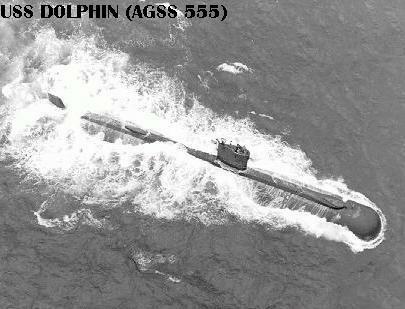 She was first assigned to this role in 1989, and underwent extensive modifications, including fitting of a larger torpedo tube, in 1993-94. Has an external shelter for ROVs, equipment for handling new towed arrays, and extensive test/trials monitoring equipment installations. Nominally considered a combat-capable vessel, but is unlikely to be usable in that role without modification and re-training. Concept/Program: The last operational diesel-electric submarine in the US Navy, has been designated for use as an operational underwater sonar target for ASW exercises. Conversion/modification for this role has not yet been completed. The vessel will be operated by NAWCAD Detachment Key West. In addition to ASW training, the boat will be used for testing and trials of new technologies. Will be manned by a small crew while surfaced for transit, but unmanned while submerged. The boat is not assigned an official designation or name. 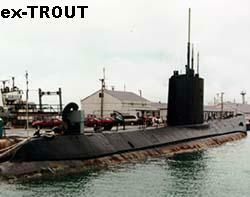 Builders: Electric Boat, Groton, CT.
History: Formerly USS Trout (SS 566); decommissioned and stricken 19 December 1978 and nominally transferred to Iran. She was never delivered; following the Iranian revolution she was laid up at Philadelphia while her ownership and fate were worked out. In 1994 she was "sold" back to the US Navy at scrap value. Concept/Program: A small, deep-diving submarine built specifically to test various submarine equipment and new technologies. Her configuration has varied greatly over the years as systems have been added and removed. Recently suffered a fire and flooding at sea and will require extensive repair to return to operation. Builders: Portsmouth Naval Shipyard, Kittery, ME. Concept/Program: A small, nuclear powered submersible initially constructed to evaluate small nuclear power plants. During the Cold War she was employed in various clandestine underwater search/recovery and ocean engineering projects; more recently she has been employed in general subsurface research and survey tasks. The submarine is supported by the tender Carolyn Chouest. Design: This is a very small submarine, with most of the hull consumed by the reactor; there is a small control room and crew space at the front of the sub. She is fitted with wheels for rolling along the ocean floor, as well as various external cameras, manipulator arms and recovery claws. Maximum operating depth is 3000 ft.
Concept/Program: A new and significantly larger "minisub" designed to carry SEALs from an SSN into coastal waters. Will be carried aboard specially-equipped SSNs. The prototype unit has been delivered for testing, and a production run of 5 more units is planned. 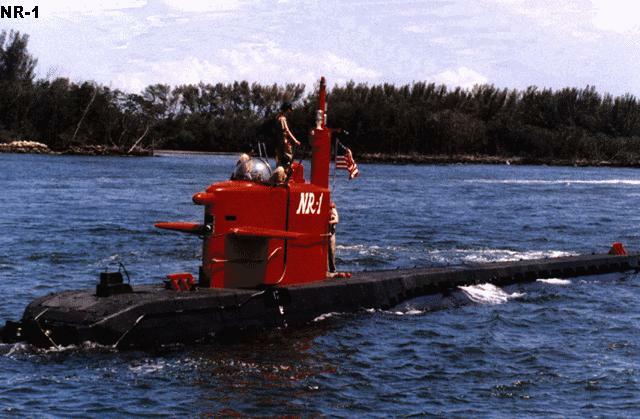 Testing is supported by the tender C-Commando, operating from Pearl Harbor. Builders: Northrp Grumman, Annapolis, MD. Design: The design features a dry pressure hull for the SEALs and submersible crew; there is an egress trunk with top and bottom hatches. Concept/Program: Rescue submersible designed to rescue crews from disabled submarines. Can be transported by air (C-5 Galaxy), specially designed support ships, submarines outfitted with transport cradles, trucks, and railroad. Supported by converted oilfield tugs Dolores Chouest and Kellie Chouest following the demise of specially-constructed submarine rescue ships. DSRV 2 has been deactivated but is retained at San Diego as a parts source. 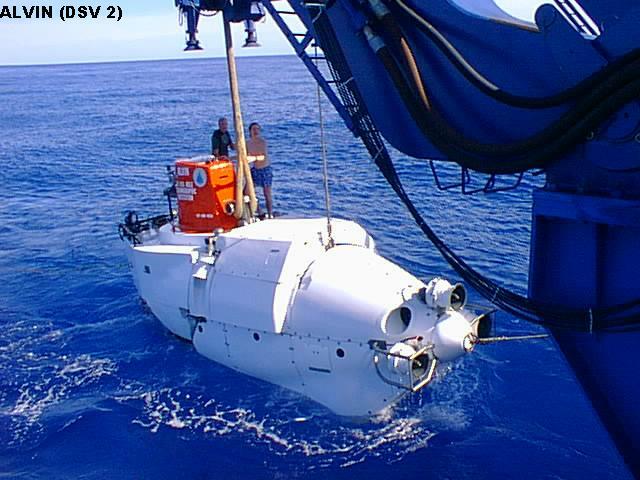 DSRV 1 will remain in service through 2005, when a new submarine rescue system is scheduled to be available. Builders: Lockheed Missiles and Space, Sunnyvale, CA. Design: Three 7.5 foot diameter spheres enclosed in a fiberglass casing, and fitted with a "universal" mating skirt to enable docking with virtually any submarine. Maximum operating depth is 5000 feet/1523 meters. Concept/Program: First of the current generation of deep-diving submersibles, Alvin has seen extensive service in research, survey, search and recovery roles, both for civilian and military objectives. She has recently been extensively modernized. Operated by the National Deep Submergence Facility at Woods Hole Oceanographic Institute, supported by R/V Atlantis (AGOR 25). The Navy exercises no operational control over Alvin. Studies for a replacement submersible are now underway. Builders: General Mills, Minneapolis, MN. Design: Single sphere in a fiberglass housing; 13,124 foot maximum depth. Fitted with various manipulator arms and can carry/operate several ROVs. Can be airlifted by C-5 Galaxy airlifter. Note: There are also 10 MkVIII Mod 1 Swimmer Delivery Vehicles. These are small, short-range submersibles with no dry pressure hull for their pasengers. Disposal Note: The other two DSVs have been deactivated: Turtle (DSV 3) on 1 October 1997, and Sea Cliff (DSV 4) on 1 August 1998. Turtle is now a museum exhibit, and Sea Cliff has become a parts source for Alvin.